This step by step woodworking project is about free single carport plans. If you want to protect your car from rain or snow, you should take a thorough look over my carport plans. 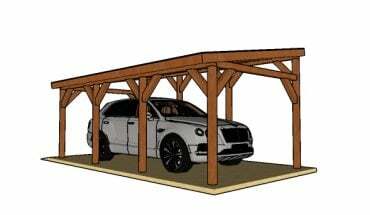 I have designed these plans so you build a sturdy carport with a gable design, spending a minimum amount of money. My plans come with step by step instructions and you can easily adjust all the dimensions to suit your needs. See my other DIY projects HERE. The first step of the project is to layout the posts for the carport. Use string and batter boards to layout the posts for the single car carport. Apply the 3-4-5 rule to the corners so you make sure they are right-angled. Moreover, you need to measure the diagonals and make adjustments so they are perfectly equal. Alternatively, you could use posts anchors. Secure the metal anchors into concrete, as to lock the wooden posts into place properly. Align everything with attention and with great care. Build the beams for the sides of the carport from 6×6 lumber. Mark the cut lines and then make 2″ deep parallel cuts inside the areas. Use a chisel to remove the excess material and then smooth the surface. Fit the beams the top of the posts and then align the edges with attention. Drill pilot holes through the beams and then insert 5 1/2″ screws into the posts. Make sure the corners are right angled. Build the rafters for the single carport from 2×6 lumber. Cut both ends of the rafters at 55 degrees. Smooth the edges with sandpaper for a neat result. Lay the rafters on a level surface and then build the bottom rafter from 2×6 lumber. Cut both ends of the bottom rafters at 35 degrees using a miter saw. Leave no gaps between the components. Make 1/2″ plywood gussets for the joists. Cut the gussets and then secure them to the joints with 1 5/8″ screws. Fit the trusses to the top of the carport and place them equally spaced. Use a spirit level to make sure the trusses are plumb. Use rafter ties to secure the trusses to the support beams. Make supports for the gable ends from 2×4 lumber. Cut the top of the supports at 55 degrees and then fit them to the front and back faces of the carport. Drill pilot holes and insert 2 1/2 screws to lock them to the trusses. Use T1-11 siding for the gable ends. Mark the cut ends to the panels and then get the job done with a jigsaw. Attach the panels to the gable ends and then secure them into place with 1 1/4″ brad nails. Leave no gaps between the sheets for a neat result. Make sure you take a look over PART 2 of the carport project, so you learn how to attach the roof and the trims. This carport with a gable roof is large enough for one car. The large roof with generous overhangs is ideal for a car, as it will protect it from rain and excessive sun. If you like my project, don’t forget to SHARE it on Facebook and Pinterest. 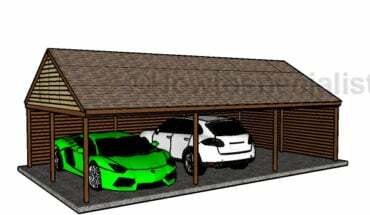 Thank you for reading our project about free single carport plans and I recommend you to check out the rest of the projects. Don’t forget to LIKE and SHARE our projects with your friends, by using the social media widgets. SUBSCRIBE to be the first that gets our latest projects.